This post was sponsored by Fonseca Port. As always, all opinions stated are my own. White port. It’s what we’re drinking this summer. I’m fairly new to white port. I’m more familiar with tawny and ruby ports. I’ve always associated those red ports as an after dinner drink, more like a dessert wine that you pair with chocolates and rich sweets. Red ports are great for the cooler months when I’m craving spice and warmth. In the hotter months I want something light and refreshing. That’s where white port comes into play. Move over rosé. I’m crushing on white port cocktail this summer. This Fonseca Siroco White Port is very dry. It is slightly sweet with an inviting fruity aroma and light oak notes. Unlike it’s red port counterpart, white port is well suited as an aperitif (meaning: typically served before a meal to stimulate the appetite). White port is traditionally served chilled on it’s own or mixed with tonic (or sparkling water). I tried it both ways and it’s super refreshing. Within a couple sips I knew this white port would be a wonderful summer cocktail base. Fonseca Siroco White Port is very crisp and light. I wanted to pair it’s clean flavors with something equally fresh. Grapefruit and mint were the winners. 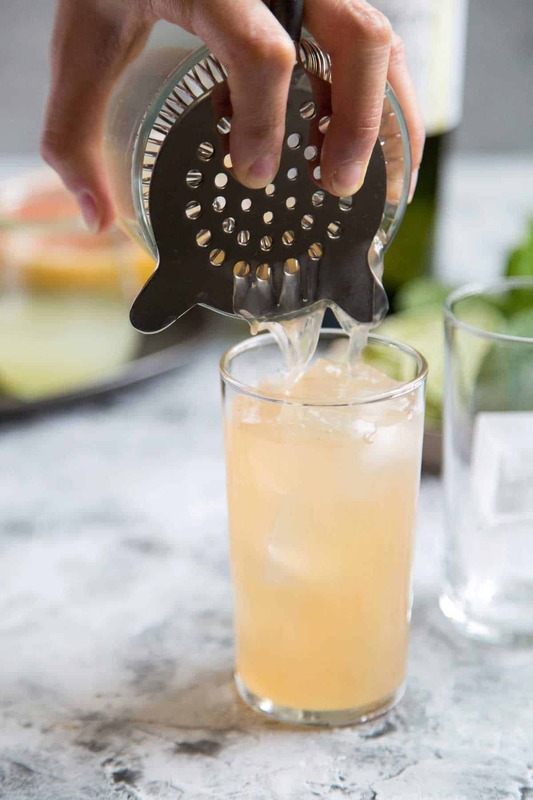 The slight bitterness of the grapefruit juice pairs wonderfully with the smooth white port. 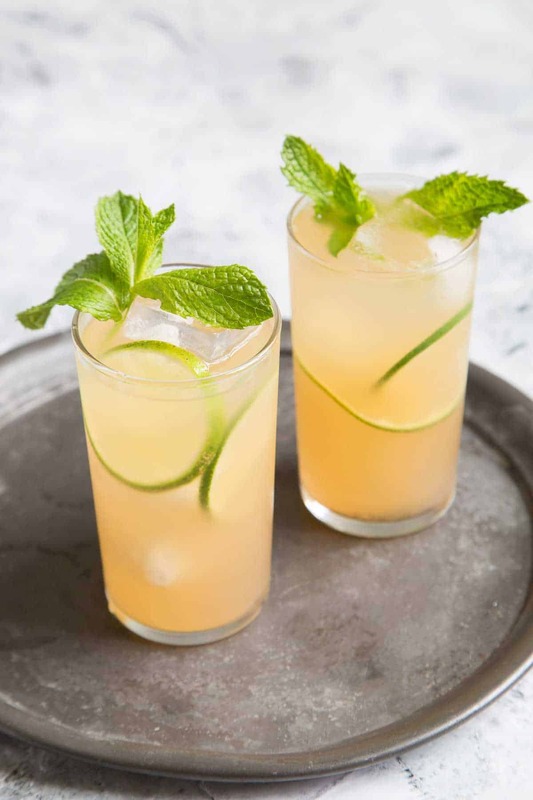 The cooling sweetness of the mint syrup rounds out the citrus and floral notes of the drink. To keep this cocktail delicate, I toned it down with a splash of club soda. This is the kind of cocktail you can drink like iced tea…meaning refills are very much welcome. 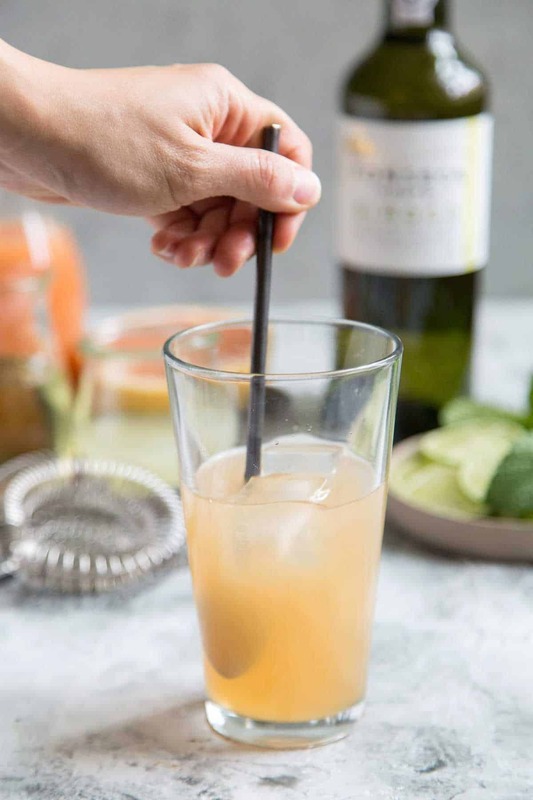 If you’re a fan of gin based cocktails (think floral notes), you’ll definitely want to give this summer white port cocktail a try. Add ice to mixing glass. 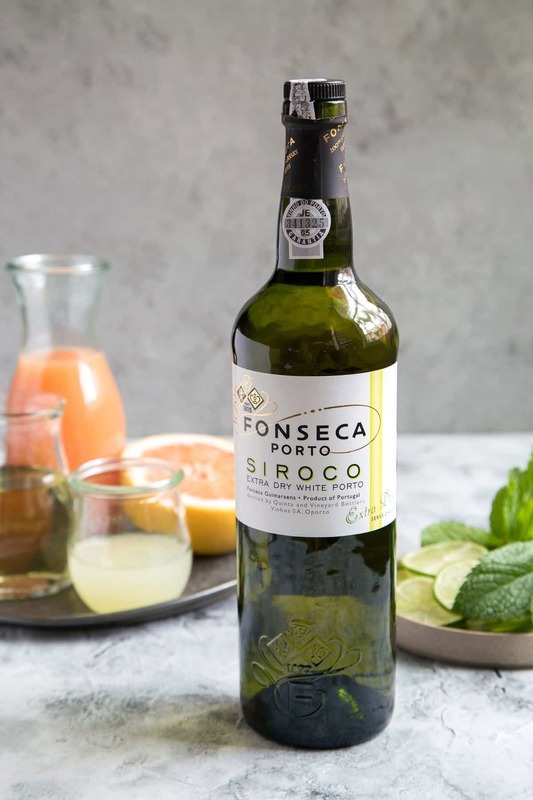 Pour in Fonseca Siroco White Port, grapefruit juice, mint syrup, lime juice, and club soda. Stir until mixture is chilled. Strain into serving glass with fresh ice. Garnish with sliced lime and fresh mint leaves. Combine water, sugar, and mint leaves in a sauce pot. Set over medium heat and bring to a simmer. Cook until sugar has dissolved. Remove from heat and allow mint to steep for 30 minutes. Strain out mint. Store mint syrup in the fridge until ready to use. Mint syrup will keep the in fridge for 2 weeks. This looks so delicious and perfect for summer! Also, your photography is amazing! This looks so good and the graprefruit/mint combo sounds delicious. Thank you! 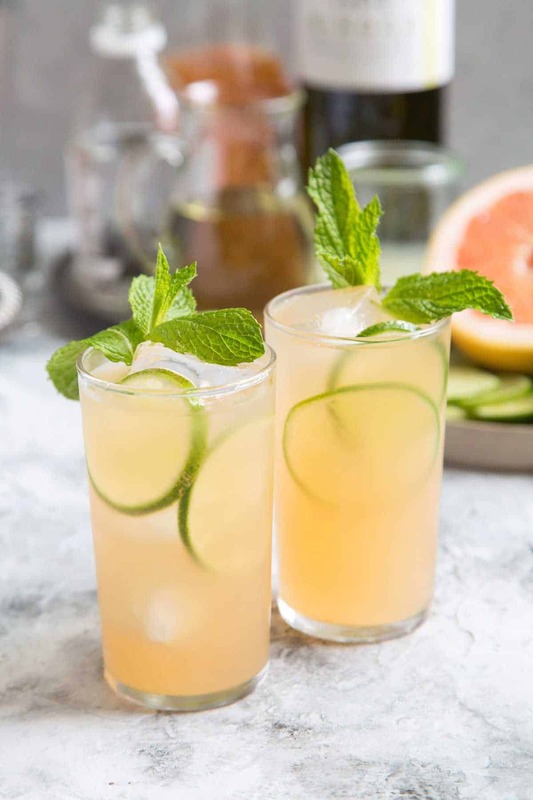 Grapefruit and mint are such a great pair! Ooh I haven’t tried many white ports either, but this is so intriguing! Love how refreshing this cocktail looks! Thanks! White port is my new summer fav! Oh how I love your blog! I love a good food blog and your photos are awesome! This is the perfect aperitif! Using freshly squeezed grapefruit juice makes it even more desirable (my favorite citrus fruit). I’ve had chilled white port before and I distinctly remember the aguardente ‘running’ through my body. This is good stuff! What a beautiful drink! I haven’t tried the white port before. The flavors sound so refreshing and good. Thank you! I hope you give white port a try this summer! Such a pretty drink and your pics are beautiful! What a great idea! We have a bottle of white port that needs to be used up, and I can’t wait to make these! Cheers! this loooks so refreashing. Perfect for summer! 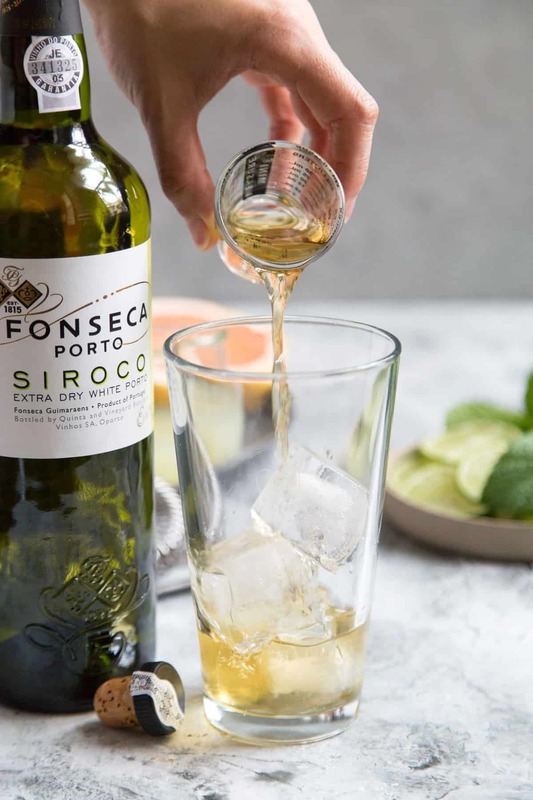 I have never tried white port, but this post has me convinced I must try it! In related news, I recently did try a white merlot, which is SO great for summer so if you ever see one, you should try it! This needs to be my next cocktail. This might just be my signature summer drink! This sounds amazing! I love grapefruit flavors! This looks incredible!!! What a perfect summer drink, I need to make this! What a gorgeous summer cocktail! I love grapefruit flavor and anything with bubbles and lime.